When you start a business, the path that awaits isn't always a straight shot. The good news is there are a plethora of resources both locally and at the state level that can help guide you along the path that is best for your business. Please feel free to download the Business Toolkit guide, courtesy of the City of Dallas. Inside you will find a step by step guide to help you find your way through the forest of Small Business resources. Below are additional resources to help you get where you're going. 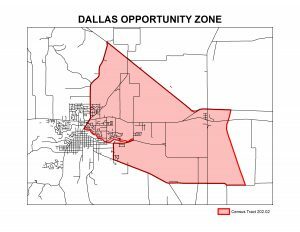 The City can assist business owners in finding business resources, locating available properties, understanding local government permitting and approval timeframes & understanding current Dallas demographic and economic trends. Chemeketa Small Business Development Center (SBDC) gives small business owners the tools and environment they need to make great decisions. We’re located at 626 High Street NE in downtown Salem, OR. Open Monday-Friday from 8am-5pm, we offer classes, small business advising, and resource materials on loan. Small Business Administration (SBA) is committed to helping small business in the US succeed. As such, several programs and laws have been sponsored that directly affect small business owners. Here, you can learn more about how legislation such as the Small Business Jobs Act and SBA initiatives such as Emerging 200 program can help you and your business succeed. Opportunity Zones can deliver significant tax savings on medium- to long-term investments in economically disadvantaged communities. This new tax incentive pertains to both the capital gains invested initially through a qualified opportunity fund, as well as capital gains earned for the investor from businesses or projects in a zone. The Secretary of State has a litany of business resources for getting you started in business, growing your business, getting registered in business and many other resources. Take a look at what they offer by clicking below. Oregon Department of Administration in partnership with other departments in the State operates a marketplace where state agencies, local government entities, and suppliers meet to buy and sell products and services for the benefit of Oregonians. We provide statewide price agreements, procurement training and certification, and sponsor monthly gatherings of procurement professionals for the purpose of sharing information and best practices. This department is driven, by Governor mandate, to contract with Oregon Small Businesses.